I bought this dress way back in 2008. I originally posted it on the old site here. If I remember correctly, the bust is about 32.5" and the raised waist is 27 which is why it refuses to fit my dress form. 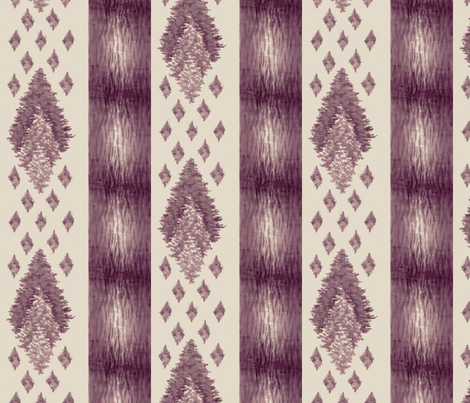 The purple print is one of my favorites and I finally have gotten around to recreating it on Spoonflower. Oh, very cool! I love this dress! It's one of my favorites from my personal collection. The dress is wonderful! I'd love some insight into the dating of the dress, if you don't mind. Since I don't know any better, I glance at this and see piped seams, a wide neckline, short cap sleeves and attached bell shaped under-sleeves, and I think "1840's!". I've seen teen garments with waists that short through about 1850. What are the tell-tale signs that this dress is Regency? This dress at the Met has a very similar neckline to the purple dress. This one also has a similar neckline although the waist is much higher. The sleeves of my dress would probably been bound around the cuff with a bit of ribbon in the 1810's/1820's. The dress shows signs of being reworked (probably making it more in style for the 1820s) on the inside and it might have been "in transition" when our seamstress gave up on the project. The hooks and eyes still look new even though the thread holding them doesn't. Oh! I forgot the bodice on this dress is almost exactly like the one on my purple dress. Thank you! The links were an education unto themselves. I really appreciate the insight! Not a problem! The reason I lean a bit more 1810's on this than 1820's is the skirt. In the 1820's, the skirts were smooth in the front for the most part. You start to see skirts that look almost modern to our eye - bias cut, cut close to the body from the high waist to the hip, ect. Since this is still a bunch of fabric gathered to the waist, it's probably earlier.